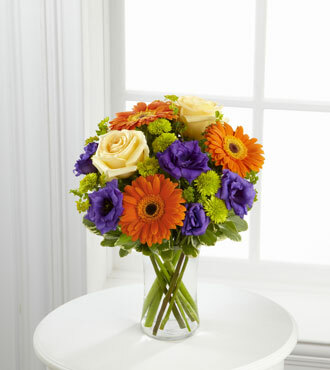 The colorful FTD® Rays of Solace™ Bouquet sends an uplifting message of hope during times of sorrow. To create this exclusive bouquet, our floral experts combine crème de la crème roses, bright orange gerbera daisies, vibrant purple lisianthus, green chrysanthemum button poms and assorted fresh greenery. Presented in a keepsake glass vase, this bright arrangement says: I’m thinking of you. Your online order includes our 7 day freshness promise and a free personalized gift card. GREAT bouquet includes 9 stems. Approximately 15"H x 13"W.
GREATER bouquet includes 14 stems. Approximately 18"H x 14"W.
GREATEST bouquet includes 17 stems. Approximately 20"H x 15"W.